Wall Street doesn't know what to think after last month's rollercoaster ride. Blackstone's Steve Schwarzman says emphatically, "This bull market is not over." But Morgan Stanley says the market correction is just an "appetizer, not the main course" of market trouble ahead. So who's right? I warned investors repeatedly for the two weeks leading up to February's big pullback, saying, "The market is overdue for a pause of some sort" and that I was "concerned about the market's overbought condition leading to a potential correction." I mean, it took just three months for the Dow Jones Industrial Average to rocket from 23,000 to 26,000. You simply can't have a run like that without the market needing to digest those gains. You see, good news can be bad news on Wall Street. 1. A big payroll number from the ADP National Employment Report that showed 234,000 new jobs created in January versus the 177,000 expected. 2. Data that finally showed the wage growth the Fed has been desperate for. 3. A model from the Atlanta Fed that predicted blockbuster first-quarter GDP growth of 5.4%. That was the first blow. Fears that the economy might heat up too much sent bond yields soaring as Wall Street worried the Fed might have to raise interest rates more aggressively this year. And that sent the market tumbling and volatility soaring. The CBOE Volatility Index (or "VIX") DOUBLED in just one day. And that's where things got ugly. A pullback triggered by a jump in volatility would normally have been much more mild. But it turned into a full-blown correction because of yet another harebrained investment product cooked up by pure greed on Wall Street. A new breed of exchange-traded funds ("ETFs") betting against volatility emerged in the last year. These half-baked products were supposed to be a sure thing, but instead blew up in investors' faces. One of these ETFs, the VelocityShares Daily Inverse VIX Short-Term ETN (XIV), was designed to effectively short the VIX. It lost about 85% of its value overnight and was liquidated soon afterward. I don't often agree with CNBC's Jim Cramer, but he was right to blame this meltdown on "complete morons" on Wall Street. Two of the largest ETFs involved had ballooned to $4 billion invested. Systematic selling as these investments imploded turned a normal pullback into a 2,000-point panic. But the good news is the market has been recovering quickly, and the underlying fundamentals driving the market are strong. Earnings are the best they've been in 10 years. Positive earnings revisions are on a record pace. And thanks in large part to corporate tax cuts, analysts are now looking for 19% earnings growth this year. The economy is healthy and growing. Unemployment is low. Personal income is up. Consumer and business confidence is high. So let me be clear... this recent market correction was NOT the start of a bear market. It was a healthy and much-needed pullback after the market's parabolic run the last four months. "This bull market is hiding a huge risk," Porter Stansberry writes. Months ago, he warned readers about dangerous bets against the VIX... and discussed what history teaches us about this trap. Read more here. "It's time to celebrate," Dave Eifrig says. The recent correction spooked investors. But as he explains, we have three reasons to be optimistic right now. Learn why you should take advantage of today's market right here. THE DEATH OF SATELLITE TELEVISION? With about 13 million paid customers, Dish Network (DISH) is one of the largest satellite-television providers in the U.S. 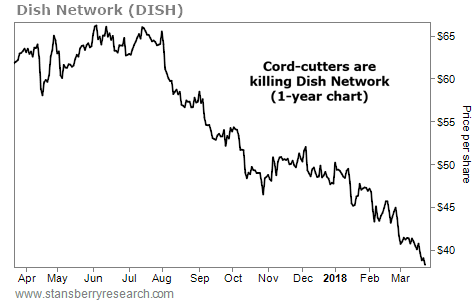 But as more households abandon traditional television packages in favor of lower-cost streaming alternatives like Netflix (NFLX) and Hulu, Dish Network has been hemorrhaging subscribers. Although Dish Network launched its own fast-growing streaming service – Sling TV – back in 2015, it continues to lose more subscribers than it adds. Last year alone, the company lost about 1.2 million satellite-television subscribers – almost two times more than competitor DirecTV. In February, Dish reported that fourth-quarter revenues fell more than 7% versus the same period a year ago.